Jose Mourinho’s popularity among his Manchester United players appears to be at an all-time low. The Red Devils travel to Anfield on Sunday afternoon looking to get one over their fierce rivals, but they are already 16 points behind Liverpool in the Premier League table. 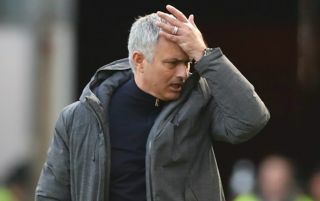 United thrashed Fulham 4-1 in their last League outing, but beating the worst side in the division seems to have done little to paper over the cracks following just six wins in their previous 15 top-flight games. Mourinho retains the backing of just one in 10 of his players, according to an exclusive report by The Sun. The newspaper quotes a senior United player as saying Mourinho has “lost 90 per cent” of his squad. Another damning quote in The Sun is attributed to a member of United staff who is said to have hinted that Mourinho may soon be on his way out of Old Trafford. “I’ll be here long after he’s gone,” the staff member reportedly said. Ahead of Sunday’s games, Mourinho is the favourite with most bookmakers who are taking bets on the next Premier League manager to leave his post. Mourinho, who was sacked twice by Chelsea (in 2007 and 2015), has been at Old Trafford since 2016.